A mentally-ill homeless woman begging in Entebbe —unfortunately, it is not a novelty. But when she has a baby, it’s another story altogether. This week, the aunties again found the mother of one our children, Dave, living in the streets of Entebbe. This time she had another baby in her arms. 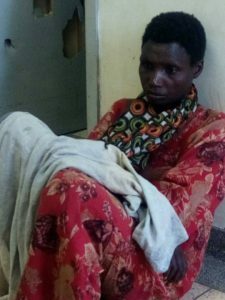 They went to the police to report the situation, reminding them that she is mentally ill and unable to care for her children. The police decided to intervene, removing the baby from the woman. For now, he is in the care of Malayaka House. As always when a new baby arrives, we immediately got to work with his care: purchasing milk and diapers, and taking him to the doctor. At the local clinic, the doctor we usually use—Muganga—treated the new baby with great affection. He informed us that he is about a month and a half old and has a small infection in the lungs. Muganga prescribed an antibiotic and has ordered the HIV test, of which we will have the results in about two weeks. Having been fed with breast milk, this little guy is doing quite well, health wise. Look at those chubby cheeks! This time around, we have another issue, to also take care of Dave’s mother. Auntie Winnie has taken her to Batabika, the mental hospital in Kampala, where she will spend three months. 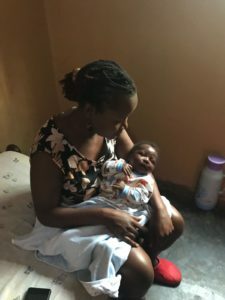 After this time, we have reserved a place in the center for young people with disabilities that EmbraceKulture has inaugurated in Entebbe—with which we are closely involved—where we hope that the mother will be able to live peacefully. With the proper treatment, maybe she will one day be able to care for her children on her own. Until then, we will care for them. No name has been chosen yet, but we’ll let you know as soon as this little guy has one! It is thanks to all of you that we can continue helping Ugandan women and children. If you want to help with the medical, milk and diaper costs of our new baby, any support is welcome! Donations can be made online using the link below.